My Daily Thoughts and Moods, My so-called life, Wonderful Things in Life, and to all who tagged me in this tag. My apology as I could not remember who else, anyhow I do find this an interesting tag. I'm eager to do this because it is different and funny. Hope you'll enjoy reading as much as I enjoy doing these. Here goes nothing! Ladies pardon me ladies for the delayed! 1. Write down who tagged you in white paper and your answer in number 2 and 3. Take a photo of it and upload the photo in your blog to share us how your handwriting looks like. - right handed or left handed ? - your favorite letters to write ? - your least favorite letters to write? - Write " The quick brown fox jumps over the lazy dog. " 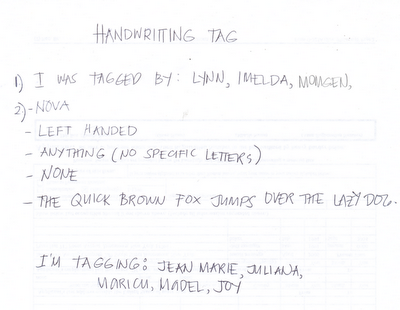 hi novs, gwapa gihapon ang imong handwriting.naulaw ko sa akoa, lol. im a frutrated doctor, thats why. i posted already your tag about my recent picture. sorry, when u passed by i was doing it pa cguro. anyhow, its her now at www.mydailybusiness.net. thanks again sis. have a happy easter season , soon. salamat sa paghimo ani. ingatz. mwah! You have a very nice hand writing Nova.